It might be the pilot introducing himself as we arrive at the airfield. Perhaps it’s the knowledge that we arrived 15mins ago and are already getting ready to board. Maybe it’s the sight of a Learjet sat on a foggy Biggin Hill runway. It could be the satisfying sound of a champagne cork popping, mixed with the gentle hum of the jet’s engines. Or maybe it’s the fact that there’s a set of golf clubs on board that didn’t incur a surcharge as costly as the ticket. Or perhaps it’s a combination of all of the above. In truth, it’s the underlying concept of convenience and knowing that you’re in control. You’re not at the mercy of the airline and 400 other passengers. Rather than being told to do your homework by a strict parent, you’re allowed to procrastinate, or hang out with your mates. But procrastinate isn’t in the ‘private jet dictionary’. An industry that was designed for efficiency offers exactly that; ease of travel. The concept is of shrinking the world. It’s a shame, then, that the perception of private jets has become one of pure luxury. A supposedly exclusive means of travel reserved for the rich and famous, the industry has struggled in recent years due to the prohibitive costs and means of booking. 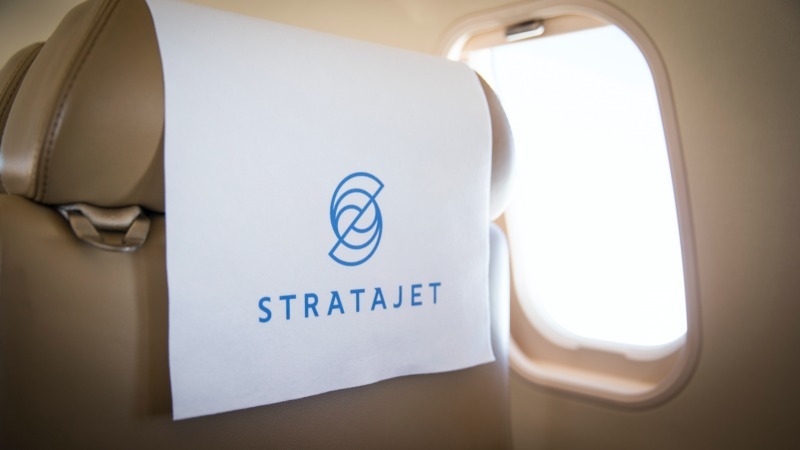 That’s where Stratajet comes in. They’re our hosts on an overnight trip and are showing us how they’re shaking up private jets, bringing them into the mainstream through technology. The Hebrides is the destination, the stunning Isle of Islay to be more specific. And here’s where ‘shrinking the world’ comes into play – Islay presents an interesting paradox in that it’s close and yet remote. Loganair offers one flight a day from Glasgow but you can’t fly direct from anywhere else in the UK. Travel time on commercial flights from London is a minimum of six hours (including check in and transfers). But door (in central London) to door (the Islay House hotel) will take us just two flying privately. It’s already mid-morning but we’ll be there in plenty of time for lunch. Private jets, then, were themselves a paradox before Stratajet came along; the most efficient means of getting from A to B but with inefficiency at the core of the industry in terms of their availability to fliers. Not that this is a concern of ours as we cruise over the Irish Sea, intermittently chatting with the pilots and getting flight route updates. We return to our plush lazy-boy-esque recliners to enjoy the descent and find that our glasses of Laurent Perrier have been topped up. If leaving the hustle and bustle of London evokes a sense of calm, arriving on Islay is almost otherworldly. The serene rolling landscape is like something out of a scene from The Lord of the Rings – you half expect orcs to come bounding over the brow of a hill at any moment – and the purity of the air is nothing short of invigorating. Stratajet has partnered with the elegant, and newly refurbished Islay House for the trip and its custom long wheelbase Defender is parked up on the runway to greet us, owner Steven Haag behind the wheel. No baggage collection, no queuing, simply hop off the plane and into a waiting vehicle and you’re away. The epitome of efficiency. Islay is home to some of the most famous single malts on the planet – known for their distinctive smoky and peaty flavours – and our whistle-stop tour of the island begins at Bruichladdich for lunch and a tour. The distillery boasts the most heavily peated of Islay’s whiskies (the Octomore) but we ‘warm up’ with other fine tipples before progressing to the ‘heavier stuff’. 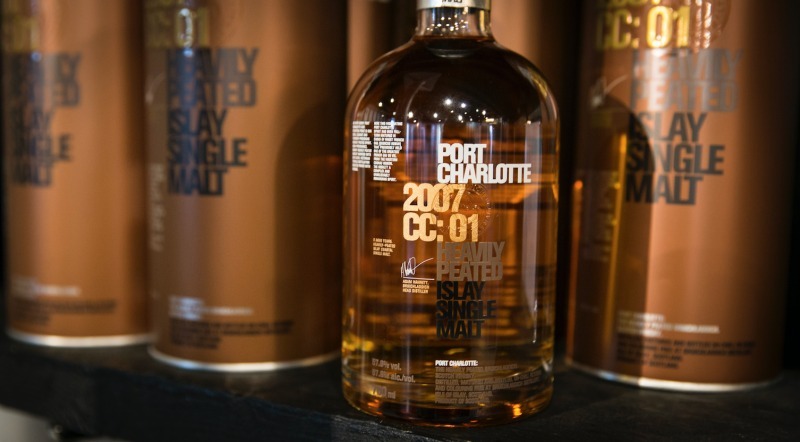 Just below the Octomore on the peat-equivalent of the Richter scale is the Port Charlotte, which is extraordinarily rich, smoky yet sweet, and reassuringly heart-warming. After a refreshing stroll on the nearby beach, we’re checking into Islay House. The historic house is ideally set in 28 acres of gardens and protected woodland, with bedrooms offering views of the sea loch. Michelin-starred executive chef Alex Floyd puts on an exquisite dinner with vegetables plucked from the House’s gardens and fresh, locally-sourced seafood, game and meat. There is character aplenty in this charming hotel from bedrooms furnished with four-poster beds and free-standing bathtubs to possibly the best stocked whisky bar in all of Christendom. Bizarrely, that’s where we gravitate after dinner, to continue our whisky education, albeit with freer pouring than at the distillery. There’s a glint in Jonny’s eye as the maverick regales us with stories of his flying ‘missions’. These include flying around the north pole to capture images of a never ending sunset in 24 time zones, and the lowest ever crossing of the Atlantic, an epic tale that saw him flying a terminally ill girl to Boston at an altitude of no higher than 500ft above sea level. Several hours later and a £300 bottle of Islay … is being drained. Woolly-headed we rise to make a tee off time at Scotland’s best-kept golfing secret. The Machrie is a Championship links course that seemingly lies on the edge of the golfing world. Refurbished and reopened in May 2017, the course is an interesting juxtaposition of wild refinement. The blustery wind coming off the Irish Sea is enough to blow away our hangovers and cause us significant problems as the ball almost wobbles off the tee. A tough test of all areas of your game, players will do well to avoid the dense rough and even the gently undulating fairways lull you into a false sense of security. This course is to be underestimated at your peril but while your stock of balls may decrease, we guarantee your satisfaction will rise thanks to the splendour of this Islay-coast hugging course. We return to Islay House for clay pigeon shooting and then have a spot of lunch at another of the famous distilleries; Ardbeg. Arriving back at Islay airport, we board the Learjet without fuss and are airborne within minutes. It’s an itinerary that would take a commercial passenger several days to complete but we complete the round trip back to Biggin Hill in just 30 hours and don’t have to wait for our suitcases at baggage reclaim. Travelling can be an arduous affair but not when it’s this easy. The experience is almost like a dream – “Did it really happen?” – since that feeling of ‘having travelled’ isn’t there. One of the remotest parts of the UK is only a stone’s throw away and we’re already using Stratajet to search for costs of future trips. That’s the only problem with private jets. 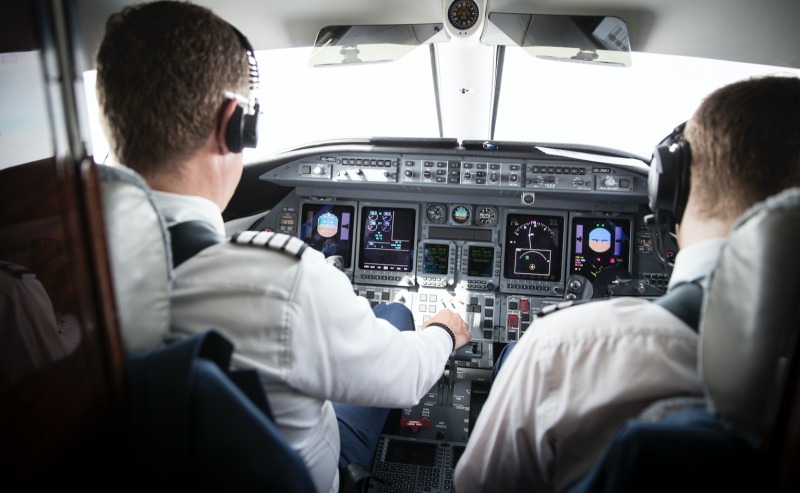 Once you’ve flown once, you’ll never want to fly any other way. Stratajet allows you to search, compare and book from the largest choice of private jets available for charter at the best prices, instantly.